The environmentally friendly yet economical ring binder option. Durable one piece construction PVC-covered board Ring Binders with no spine label. Constructed from 100% recycled board and recyclable polypropylene. Size - 25 mm capacity 4 'D' Ring Binder - A4 size. Price each - Order 20 to receive a box. 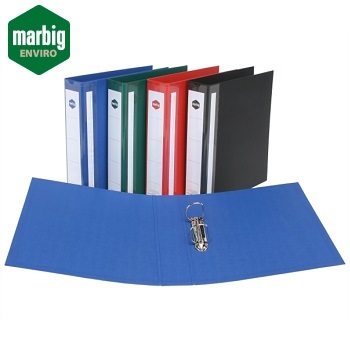 The binder that is the environmentally friendly option for your filing. 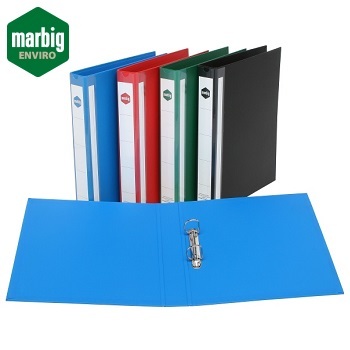 Deluxe durable PVC-covered board A4 Ring Binders with spine label holder. Oversized covers to accomodate sheet protectors and/or extra wide dividers. Size - 38 mm capacity 4 'D' Ring Binder - A4 size. Size - 50 mm capacity 4 'D' Ring Binder - A4 size.